Claudio Monteverdi was born in Cremona in 1567. It was obvious that he was talented from a young age because he published his first collection of music at the age of 15. In his early adulthood, he lived in Mantua as a musician employed by the Gonzaga family. He composed a number of madrigals at this time, but they weren’t all well received. 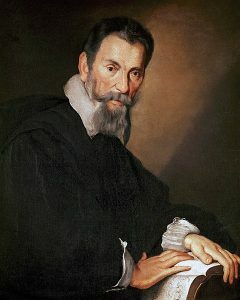 Monteverdi was lambasted by music theorists because of the dissonances in his compositions. His brother, the theorist Giulio Cesare Monteverdi, came to his defense. Giulio suggested that Monteverdi was partaking in a new style of music called the seconda practica that emphasized freer counterpoint and rhetorical expression. During his time in Mantua, he lost his wife and one of his daughters, which had a profound effect on him. His relationships with his employers and colleagues became strained as the years went by. Eventually, he left Mantua for Venice in 1613 to take on a position at Saint Mark’s Basilica as a director and composer. He died in Venice in 1643. His work was incredibly influential and well known throughout Europe. His notable works include the operas L’Orfeo and L’incoronazione di Poppea, his madrigals, and his vespers. Chew, Geoffrey, and Tim Carter. “Monteverdi, Claudio.” Oxford Music Online.